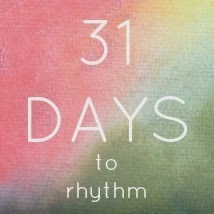 Would you like to "get your rhythm on" before the holidays this year? Win a spot in this fun, engaging, warm and extremely helpful online eCourse! To enter, leave your name in the comments below and share an aspect of rhythm that you'd like to work on. For another entry, like and share the give away announcement on the Celebrating the Rhythm of Life FaceBook page and mention it in a comment below. For an additional chance to win, mention it on your blog and share the link in the comments below. If you've already signed up for the eCourse and you are the winner, you'll receive a credit of $25 towards another eCourse or the Monthly Program. Be sure to check back here by Tuesday evening to see if you are the lucky winner. Mornings seem to be the most difficult. My 3 yr old is in a morning program a few days a week so I can work from home, and that adds an extra level of personal stress just in getting a 3 yr old and 1 yr old ready and out the door. But even when we stay home I have a hard time finding the wholesome discipline between hanging out in pajamas all day and attacking the morning like a drill sergeant. Would love help on domestic tasks rhythm so I have more time to do things I enjoy more and don't always feel like I am playing catch up. Liked and shared on fb. Thanks for the opportunity. I'd love to work on homemaking in our daily rhythm - for example too easy to cook meals without involving everyone at the end of a busy day. Liked and shared too. I work at home doing in home child care but my morning with my daughter (almost 2) needs work.... during the day while we have friends over we have a good rhythm going... I need to work on our morning rhythm, specifically a good breakfast rhythm, having a bit of special time in the morning before our "work" (which we both love!) Love reading your blog! We have a good school rhythm, but need help with meals and bedtime! Two parents and three children. Rhythm for one parent is easy, two seems a lot harder. I'd like to work on the collaboration and intentions behind authoring rhythms that work for both parents and the family as a whole. I would love some help with our rhythm. Lots of chaos in our home right now. I would like to be more consistent in following our rhythm. I would like more consistency in our daily rhythm. I liked and shared. We need help with our naptimes and bedtimes! Thanks! I would love help on bedtime routines and coordinating daily rythm for children of different ages! Secular Waldorf :: Is that Possible? Rhythm Boot Camp is Back! Why the Silence Over Here?